If you’ve tried everything you can think of to sleep better, from avoiding caffeine, daytime naps, and turning off the lights at bedtime, here’s something else you might want to consider- a weighted blanket. Weighted blankets were originally developed to provide pressure and sensory input for children with autism and similar disorders. They have now walked their way into the mainstream insomnia market, thanks to their calming and sleep-inducing effect. In this article, we will be helping you decide the best weighted blanket for you, we will be looking at 5 awesome blankets, describing the benefits and cons of each one. YnM weighted blanket is an affordable, versatile blanket that offers adequate comfort and great sleep therapy for both adults and kids with autism, anxiety, insomnia, body pains and ache. This soft product is a 7 layered blanket designed with more glass beads and less fiber for better temperature control and to comfortably take your body shape when you sleep. Also, each layer of the glass beads is sewn in a way that prevents movement and noise when you are asleep while evenly distributing the weight of the blanket around your body. It provides maximum comfort all year round, either during winter and summer. It basically allows you to sleep well on a cold night by keeping you warm and it doesn’t leave you leaving super hot (no need to toss aside) on a cozy night. According to some reviews, it rips off easily at the seam, therefore, losing a lot of the beads. This blanket is made with 100% cotton and it comes with a soft, removable duvet cover, which makes it machine washable and excellent for summer, as you can easily remove the duvet and fold neatly in a place. It is filled with non-toxic, hypoallergenic plastic poly pellet which is well secured in the blanket. The weight of this blanket triggers the release of serotonin, a relaxation hormone, that boosts your mood and helps you sleep better and faster while combating anxiety, insomnia, and the likes. 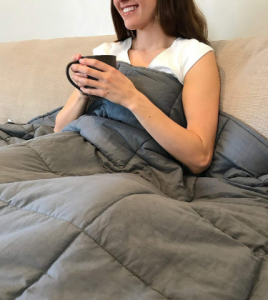 ZonLi cool weighted blanket which is made of 100% breathable natural cotton which makes the blanket cool, durable and is optimized for a comfortable temperature. This blanket, made with new technology, has small squares in it to evenly distribute the weight of the blanket and 2 layers of breathable microfibre to secure the beads in place in order to avoid leakages of the non-toxic beads. It is quite affordable than a good number of other blankets and it comes in different sizes and weights and best purchased according to recommended body weight to blanket weight. This low budget 100% breathable high-density natural cotton weighted blanket is made to naturally relax nerves and relieve stress by stimulating a feeling of being hugged. With each compartment of the blanket filled with tinner cotton and non-toxic, odorless, glass beads sewn to a medium size to ensure even distribution of weights, the blanket stimulates and helps you sleep deeply and comfortably. It does not include a removable cover but is machine washable on a low and gentle setting. This blanket comes with a 30-day trial and a 3-year warranty. It is, however, not recommended for pregnant women and children under 5 years of age. If you find it really difficult falling asleep every night, tossing and turning every now and then on your bed, or dealing with anxiety, insomnia, then you might want to give Good knight weighted blanket a trial. This 100% premium cotton with non-toxic poly pellets which distributes weight evenly, allows the extra weight of the blanket calm your nervous system, help you fall asleep faster and even improves the quality of your sleep while combating sleep disorders, sensory, anxiety and relieving stress as well. Ideal for anyone, this 60″ x 80″ blanket is suitable for both teenagers and adults as far as 6’6″ tall. Good knight weighted blanket, however, does not come with a duvet cover but is machine washable. When choosing a blanket, it is important to know that every individual’s choice and preferences differ. While some might prefer something lighter, others, something heavier. As a general rule, the weight of your weighted blanket should be based on your body weight and not the weight of your bed. Here are a few guidelines to help you choose the best weighted-blanket for you. First of all, it is important you know that it isn’t advisable to use weighted blankets for children under the age of 1. For children who are between ages 1 and 6, it is important to see your doctor or health specialist before using a weighted blanket for them. To get the recommended weight for your kids, calculate 10% of their body weight plus 1 lb. 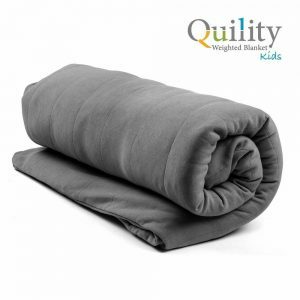 A medium size weighted blanket is recommended for kids of this age and to get the best weight, calculate 10% of their weight plus 2 lbs. A large size weighted blanket is recommended for individuals in this category (from 13 years and above). To get this, calculate 10% of your body weight plus 3 lbs. If you plan to share your blanket with your partner or perhaps, you are on the large side, then you might want to consider a full-size or queen size weighted blanket. Also, if you tend to toss and turn a lot at night, a full size weighted blanket wouldn’t be a bad idea as the extra room it provides will help your restlessness. Weighted blankets are blankets that are heavier than a standard blanket. Usually, range between 4 and 25 pounds, they use the DTP (Deep Pressure Touch) therapy by gently applying pressure to the body to increase the release of Serotonin, a chemical in the body that promotes relaxation. Also, according to a study from the Journal of Sleep Medicine and Disorders from 2015, a weighted blanket helped people with insomnia sleep better. Thanks to the effect/sensation of being hugged you get when using a weighted blanket, children or adult dealing with autism or any sensory processing challenge(s) can easily feel calm and destress by simply using one. Depending on your preference and choice(s), you definitely now know what product is worth your money. Let’s talk about how best to maintain that blanket. All weighted blankets require different washing/maintenance techniques. However, irrespective of the product or fabric of yours, here are a few tips and guidelines to help you enjoy the best of those blankets. It is first important to know that weighted items are best washed alone. That way, there is no form of hindrance to catch or damage your blanket. Also, washing your weighted blanket with strong detergent, fabric softener and chlorine bleach isn’t advisable as it might cause damages to your blanket. Instead opt for gentle detergent and non-chlorine bleach, if you must use any. Fabric softener can build up in the blanket making it less soft and even make it rough and scratchy while chlorine bleach will break down the fibers in the fabric. Ensure you spread your blanket evenly over your laundry line or a tub if you choose to hang dry in order to keep your blanket from losing its shape. Even though, I actually don’t picture anyone doing this, should you be considering ironing your weighted blanket, please don’t! 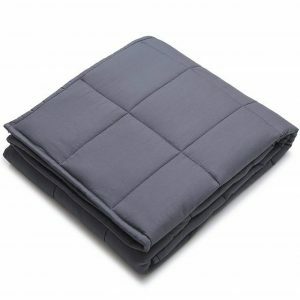 Machine wash your cotton weighted blanket in either warm or cold water and dry on low or medium heat. If your blanket has sharp colors or dark colors that are likely to run, wash it first in cold water with 1 cup of salt to keep the colors from running. To wash your fleece blanket, you may soak for about 30 minutes, wash with warm water and dry on low heat. Minky fabrics wash easily and come out as soft as when you put it in. You can wash with warm water but be sure to avoid using any fabric softener whatsoever as they are resistant to softeners. So, do not attempt using one for this. If you have stubborn stains on the blankets, you can make use of non-chlorine bleach. Now, you are ready to purchase and enjoy your next weighted blanket. Did you find this review helpful? Have you used a different weighted blanket product that you think should be on this list? Please let us know by leaving your thoughts and sharing your experience(s) in the comment section.